There was a buzz of excitement and anticipation in the library on Friday as an eager group of readers waited to see if their name would be selected to win the AFL indigenous football or if they would be announced as the winner of our coveted Yeo-Low Medal for Reading for 2017. 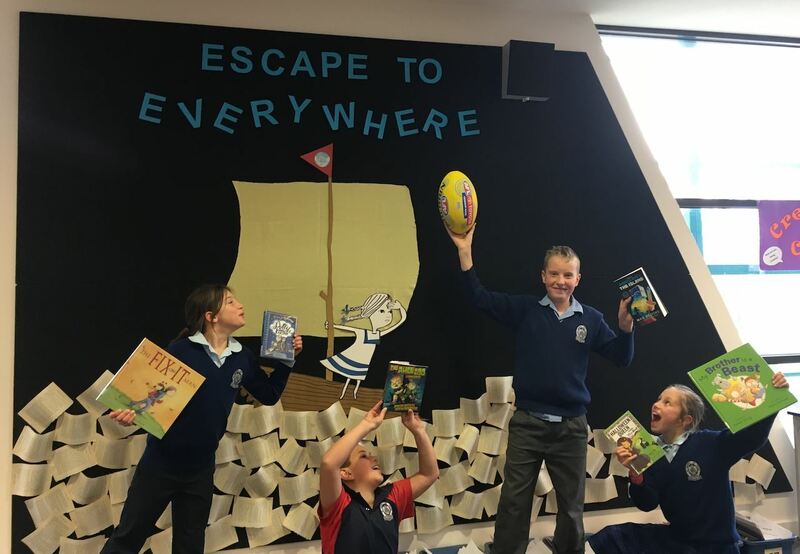 Congratulations to the 57 students from P – 6 who completed the reading challenge during Term Three by reading nine books based on the Book Week theme ‘Escape to Everywhere’ and also completed a creative response about one of the books. Your enthusiasm for reading and amazing creativity make my teacher librarian heart sing! 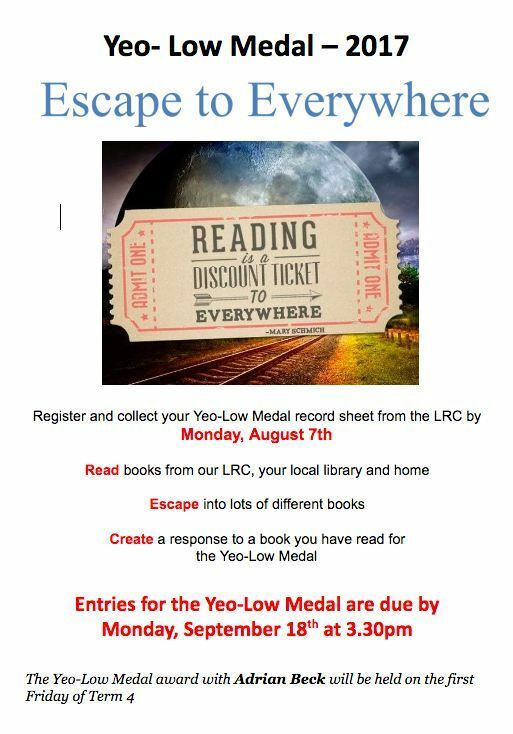 This is the third year we have held our Yeo-Low Medal Reading Challenge that was started by our author friend Adrian Beck in 2015. 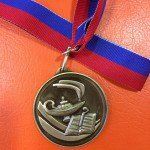 The Yeo-Low Medal combines our love of reading and AFL football and you can read about how it started here. Adrian has supported our Yeo-Low Medal readers each year and for the past two years we have been very lucky to have both Adrian and author friend Felice Arena host our Yeo-Low Medal award ceremonies which have been such a fun celebration of reading. This year Adrian and Felice outdid themselves…. A big congratulations to our winners and to everyone who participated in the Yeo-Low Medal Reading Challenge this year! The Yeo-Low Medal for Best and Fairest Reader is back in 2017! This is the third year for our Yeo-Low Medal Reading Challenge that was started by our author friend Adrian Beck. You can read how it all started here. Adrian has supported and encouraged our Yeo-Low Medal readers each year including last year when he organised a surprise message for our readers. Adrian also brings lots of fun to our Yeo-Low Medal Award Ceremony as you can see in 2015 and with Felice Arena in 2016. 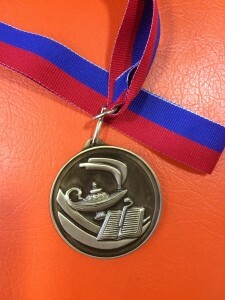 Reading for our Yeo-Low Medal is held in Term Three. It is a Reading Challenge that combines our love of Australian Rules Footy and reading. The Yeo-Low Medal is almost as coveted as the Brownlow Medal! Everyone who successfully completes the Reading Challenge receives a certificate and a chance to go in the draw to win our Indigenous football (a yellow one this year). Each reader is also in contention to win our prestigious Yeo-Low Medal for Best and Fairest Reader. Students from Prep- Year 6 can participate in the Yeo-Low Medal by reading the books in the challenge based on the Book Week theme and completing a creative response to one of the books. Today was our second Yeo-Low Medal Award and an exciting day for the 73 students who completed the Reading Scavenger Hunt for our 2016 Yeo-Low Medal. A rainy day forecast changed our school’s usual Footy Day plans so I decided to hold our Yeo-Low Medal Award in the library with our author friend Adrian Beck. Little did we know Adrian had a surprise for us and had invited Felice Arena along as well. How lucky were we to have two of our favourite authors in our library!! Our Yeo-Low Medal readers should be VERY proud of their efforts to complete this year’s Reading Scavenger Hunt. Between them they have read over 600 books by Australian authors! I added a creative element this year and our library is currently a gallery of their creative work including cakes, Anzac biscuits, models, posters, poems, drawings, story cubes and book reviews about the books they have read. During our award ceremony Adrian serenaded us with a song; we enjoyed sharing some of our creative work; people crossed their fingers hoping their name would be drawn for the Indigenous football (or two mini footballs) or that they were going to be presented with the Yeo-Low Medal this year. After cheering our winners, Felice had everyone up on their feet celebrating their fabulous reading efforts with his ‘Umpire Dance’. Today was a wonderful reminder that reading is fun! Thank you so much Adrian and Felice for being so generous with your time and helping us to celebrate our Yeo-Low Medal Award. We are the luckiest school library in Australia!! Here are some photos from our day…. This term it has been wonderful to see so many of our Australian picture books and novels being read by students participating in our Yeo-Low Medal for reading. Wednesday, September 7th is the final day to hand in your Reading Scavenger Hunt and creative book response. We already have a Sherrin footy cake, poems, recipes, book reviews and posters handed in by some keen readers! Our author friend Adrian Beck will be here again for our Footy Day to choose the name of the lucky reader to win the Indigenous football and to award our prestigious Yeo-Low Medal. Last year Adrian made fun videos to encourage students with their reading. When Adrian said he was sending a video this week for our Yeo-Low Medal readers I wasn’t quite expecting this!!! THANK YOU Adrian, Shane and Lauren!! The Yeo-Low Medal for Best & Fairest Reader is back in 2016! Reading for our Yeo-Low Medal is held in Term Three. 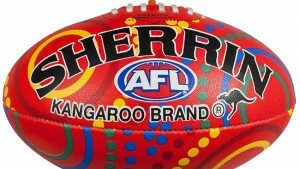 It is a Reading Scavenger Hunt that combines our love of Australian Rules Footy and reading! You can read HERE how it all started last year with our author and friend, Adrian Beck. Everyone who successfully completes the Reading Scavenger Hunt receives a certificate and a chance to win our Indigenous football (a red one this year). They also have the opportunity to win our Yeo-Low Medal for Best and Fairest Reader. Adrian will once again select the lucky winner of our Indigenous football on Footy Day on Friday, September the 9th and present the Yeo-Low Medal to a person selected for their reading effort in the Scavenger Hunt. Read HERE to see the fun we had last year and our lucky winners. 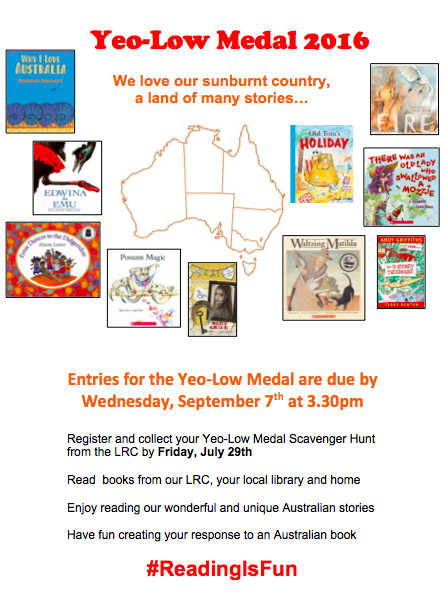 This year our Reading Scavenger Hunt is closely connected to our Book Week theme of Australia: Story Country and our Yeo-Low Medal readers will be challenged to read a variety of Australian authors and their stories.